Dr. D. David Saadat played soccer, table tennis and badminton while growing up in Iran. As a teenager, he made the brave decision to move in with his uncle in California where he attended Beverly Hills High School. Dr. Saadat’s fascination with facial anatomy inspired him to specialize in otolaryngology and facial plastic surgery, because the face is the most intricate and challenging area of the body. After earning his Bachelor of Arts degree in Cellular and Molecular Biology at California State University, Northridge he went to medical school at the University of Southern California (USC). 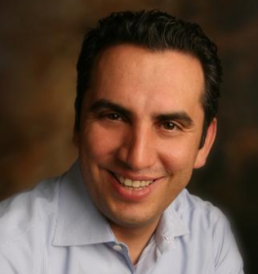 Dr. Saadat completed a fellowship in Facial Plastic Surgery at USC, and is triple board certified in Facial Plastic Surgery, Otolaryngology and Sleep Medicine. Castaway, Scarface and The Godfather are some of Dr. Saadat’s favorite movies. On weekends, he enjoys spending time with his family and friends and going to the movies. His partners describe him as obsessed with perfect aesthetics, talented and as having an eye for detail.